Everything Just Sew: Spring flowers - oops, wrong season. Spring flowers - oops, wrong season. I'm letting impatience to post overtake desire to look fabulous here. I finished my latest Alabama Chanin dress last week and it has been TOO FRICKIN' COLD to venture outside for nice photos. Snow, rain, howling gales - the works! Fortunately Dunedin has not fared too badly, unlike many other parts of the country, but still it seems like it has been a long wait for decent light. Today I grabbed an opportunity, and here is the result of around 120ish hours of work. A tank dress from Alabama Studio Style, with Abbies Flower stencil, which I resized a bit and fattened up a bit. I base the 120ish hours on the fact that I timed one 1.5m length of thread to take about an hour to work and I used 200m of thread. It's a very rough estimate, but no way am I timing one of these babies for real! I know I started this dress before I went to Wellington in March, so it is months of work. And I am so in love with it I cannot express it! Now all I need are an appropriately coloured merino thermal top and leggings to go underneath and I will be able to WEAR it! My craft group ladies are probably a bit sick of seeing this dress every fortnight for the past three months or so, so here you go ladies - this is what you'll be seeing for the next while. Not three months though as this is waaaaaaaaaay quicker to stitch! 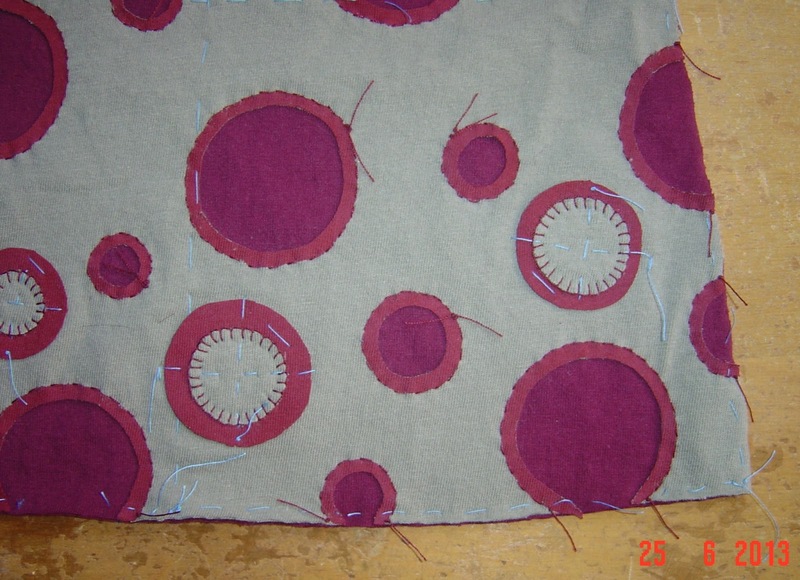 This is one panel of a six panel skirt, which got to this point in only a day or two. I'm also making a matching corset top, to be worn together or separately. 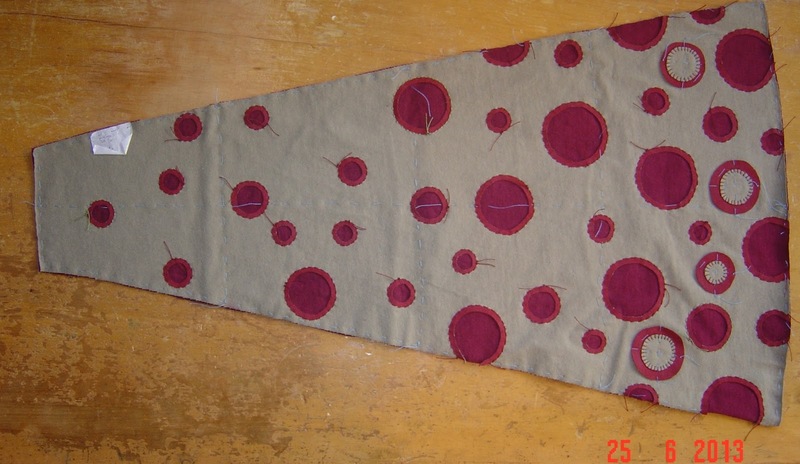 Close up of the stencilled, stitched and snipped dots and the appliqued ones. 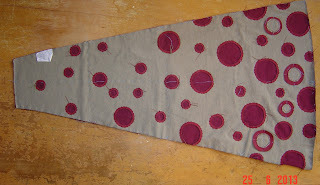 I want to get a thread which matches the top layer to blanket stitch the maroon appliqued dots. Not even close to getting tired of the Alabama Chanin style, making it or wearing it. I am actually a bit antsy because I know what I want to make next and I'm worried that I won't be able to find the shade of fabric I want. No I don't have an Alabama Chanin problem, why do you ask? That's a fabulous dress that I imagine looks even more awesome in person. I love Alabama Chanin clothing. Nice work, and I lot of it! Awesome! I love Alabama Chanin clothing too. Beautifully done! It is gorgeous.